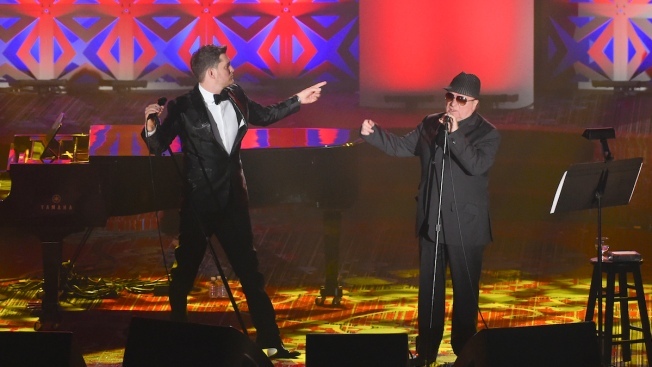 Honoree Van Morrison and Michael Buble perform together at the 46th Annual Songwriters Hall Of Fame Induction and Awards Gala at the Marriott Marquis on Thursday, June 18, 2015, in New York. Grammy winning Irish singer-songwriter Van Morrison, who wrote songs like "Brown Eyed Girl" and "Wild Night," will receive a lifetime achievement award for songwriting at the Americana Honors and Awards show on Sept. 13. The Americana Music Association announced on Friday that Morrison will also headline a concert the following night as a part of the Americana Festival. Morrison rose to prominence in the '60s as the lead singer of the Northern Irish band Them, known for their song "Gloria." As a solo singer, he combined soul, R&B, Celtic folk and jazz with mysticism. He is a member of the Rock n' Roll Hall of Fame. Americana Music Association Executive Director Jed Hilly said Morrison "created a catalog of music that has served as a soundtrack for our lives."